When: This recipe requires a minimum of an hour of marinating (you can also start marinating the night before if easier – and even make it alongside Nigella Lawson’s awesome Buttermilk Marinated Chicken), but once that’s done, you can be finished in under a half hour. The nuggets freeze and travel easily. Why: Because you can try to fight the good fight, but the nuggets will always win in the end. Organic, less-junky pre-fab versions exist in your supermarket’s frozen aisle, but at over six bucks for just two modest servings, they are pricey. How: Easy. 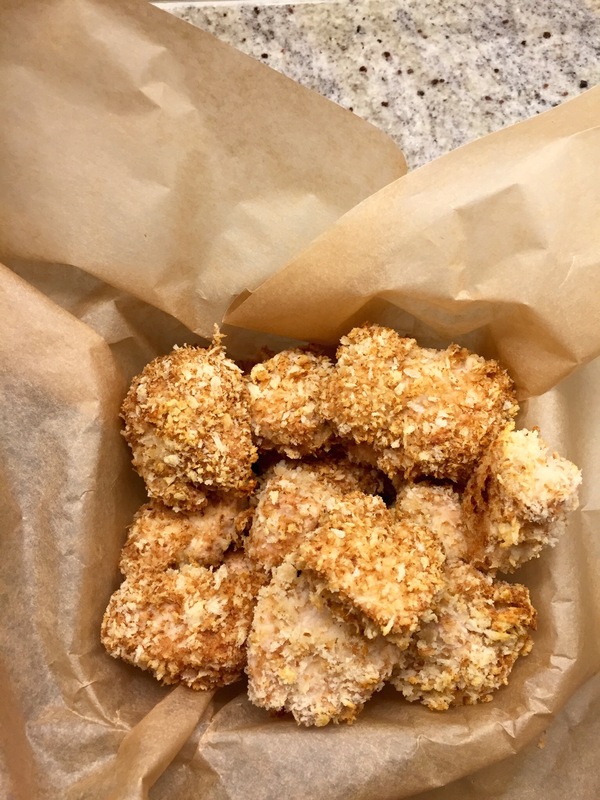 Panko, aka: Japanese-style bread crumbs are the key. Toast them on your stovetop to give them the color of fried goodness (without all the grease and oil). Because my son has an egg allergy, we make our nuggets egg free using Applesauce as the adhesive to stick the panko to the nuggets. You can certainly dredge your nuggets in 1 egg that’s been lightly beaten, if you prefer. The recipe will delight adult and child aliike, as evidenced by the amount of time my husband skulked around the kitchen before I finally allowed him to gobble down a few of these healthy golden nuggets. Serve with ketchup, make your own dipping sauce or use applesauce like we do. The possibilities are endless! To prepare the nuggets combine the first 4 ingredients in a zip-top plastic bag. Marinate in the fridge a minimum of an hour or up to 1 day. Place Panko in a large skillet and cook over medium heat until nicely golden, stirring frequently – about 3 minutes. When ready to prepare, remove chicken from marinade and discard marinade. Sprinkle chicken with 1/4 teaspoon of kosher salt. Place Panko in a zip-top gallon bag. Combine applesauce and water in a shallow dish. Dip half of the chicken in the applesauce mixture and place in the panko bag. Seal it and shake to coat evenly. Arrange chicken in one layer on a baking sheet. Repeat the process with the remaining chicken. Bake chicken for 12 minutes or until fully cooked through. Cool a bit and serve with your favorite dipping sauce or as we do in our egg free home, applesauce or a combo of yogurt and dijon mustard! Thanks, Kim! Will check it out!